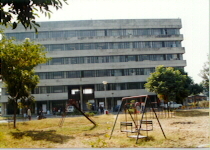 yes GMCH had its own very history with building at 38 named as PRAYAS . It an year which welcomes you to life sciences and you are wonderfully amused with world that exists in all of us………. it also marks an end to theschooling era but STARTS A NEW SCHOOLING ERA which many of us acknowledge as time passes……………..
Well trauma ends with those 6 continuous exams and practicals whose memories remain cherished in you foreever and every exam seems to be easy compared to those last days of first prof………………….